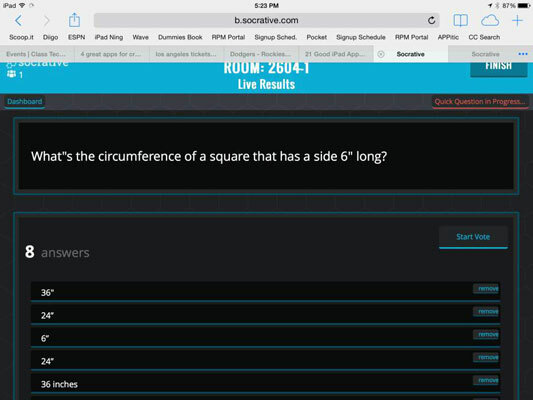 Socrative is a simple student response system that works on iPads and any other device with a web browser. When teachers sign up for a Socrative account, they get a virtual “room” where they can engage students in different educational exercises and games. It only takes a few seconds to start a Socrative quiz, which makes it a great tool for those spur-of-the-moment occasions when you need impromptu feedback. You can use Socrative by downloading the app or by going to the website at Socrative.com. Download the Socrative Teacher app or open your web browser and visit the Socrative website to sign up for a free teacher account. Have students join your room. You get a unique room number when you sign up. 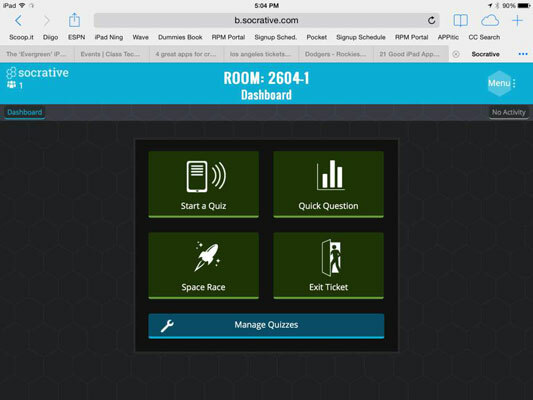 Ask your students to use the Socrative Student app and join your room by entering the room number. Note that the number of students that have joined is displayed in your Teacher Dashboard. Students are notified that Socrative is waiting for the teacher to start an activity when they enter the room. Start a quiz that you have prepared in advance or just start an impromptu activity by selecting the Quick Question option. Select Quick Question and set your question type by choosing between Multiple Choice, True/False, and Short Answer. Give students the question orally or type it into the question field in Socrative. After you start the activity, students are prompted to answer on their iPads. Note that the short answer type has additional options you can set to allow multiple responses and ask for a student name. The default response is anonymous. As students submit their answers, the responses are automatically displayed in the Teacher Dashboard. You can obviously elect whether to project them for students to see or keep them private. If you’ve selected Short Answer, you have the option of showing the responses to students and asking them to vote on the most popular response. You can also remove any responses you don’t want displayed. Select Finish when you’re done and the activity will be closed to further responses. If you’ve used the Short Answer type, you can elect to have a report e-mailed or downloaded.